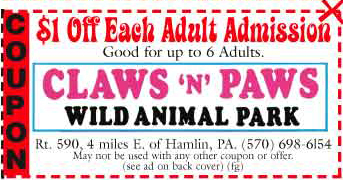 Use these coupons for the best attraction discounts in the Pocono Mountain Region, the Poconos, NE PA, Scranton, Wilkes Barre, NEPA attractions, etc. 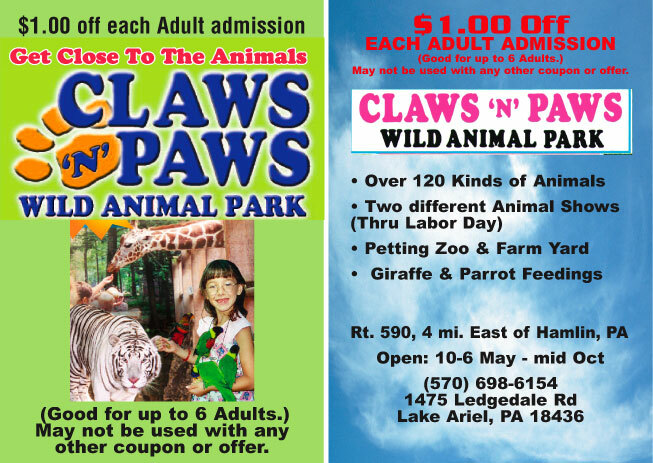 Visit the areas leading attractions such as Claws N Paws Wild Animal Park, Houdini Museum tour & Stage Magic Show, Adventure Sports, Haunted, Mind Mysteries & THE Beyond, Scranton Ghost Walk, etc. In many cases if you show them the coupon on your phone, or just mention the coupon they will honor the discount. 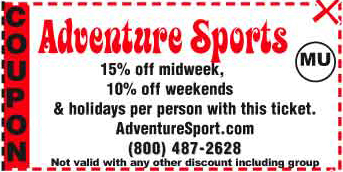 Scroll down for move discount coupons for the Pocono Mountains Region / NE PA Pennsylvania - North Eastern Pa. attractions. 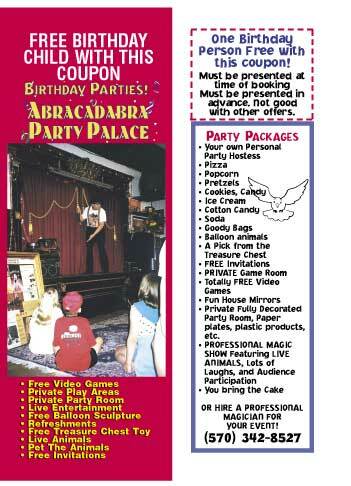 Attractions include , Claws N Paws Wild Animal Park, Houdini Museum tour & Stage Magic Show, Adventure Sports, Haunted, Mind Mysteries & THE Beyond, Wisecrackers Comedy Club, etc. PRINT OUT THIS Page and use these coupons. It is best to call the attraction first, as many hotel, motel, restaurant, & attracions offers are seasonal and offers can change. 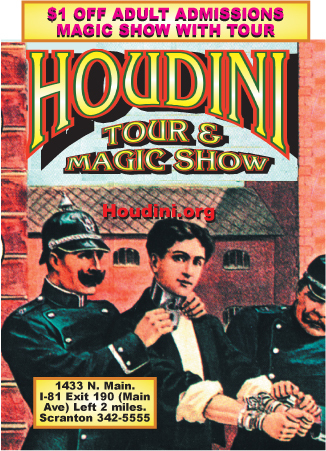 Mention the name of this site when you reserve or arrive for The Houdini Museum Tour& Magic and get an additional $1.00 off for each ticket. 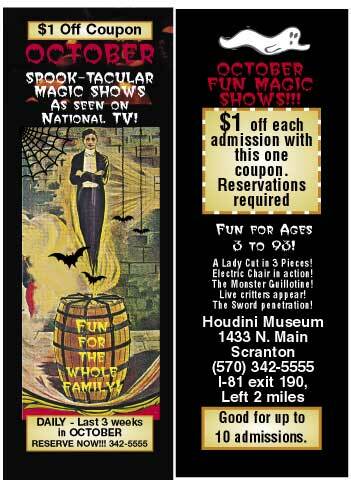 The Houdini Tour, Magic Show and Museum is one of the areas leading attractions. featured on more national television shows than all area attractions combined. The only building in the world entirely dedicated to Houdini. 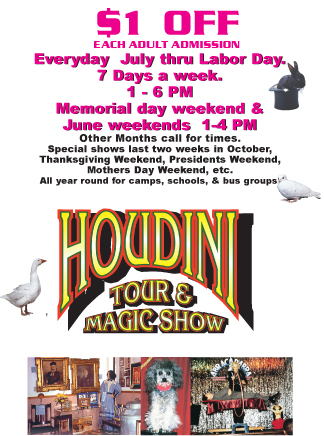 Houdini films, antiques, guided tour and in mid afternoon a spectacular live 50 minute stage magic show with live animals. 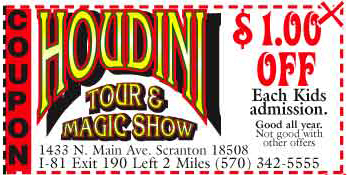 Their magicians have STARRED on a Home Box Office Special and other network specials with such Hollywood celebrities as Tony Curtis (who played Houdini in the movie biopic) and Bill Cosby, etc. Reservations suggested. (570) 383-1821 or (570) 342-5555. 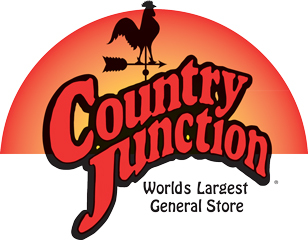 Mention the name of this site when you reserve or arrive and get an additional $1.00 off for each ticket. are on display in as close to natural habitat as possible. Open at 10 AM. and learn its history. Every day of the year rain or shine. store for great discounts every day. No coupons needed. New!!! We can make your hotel reservations and help you make your choices. Honeymoon & romantic getaway packages as well. No Obligation. http://PoconoHotels.com - CLICK HERE NOW!FREE- Reserve and save money. Honeymoon Hotel Packages. CLICK HERE NOW! Check back in often as many, many will be added by summer. 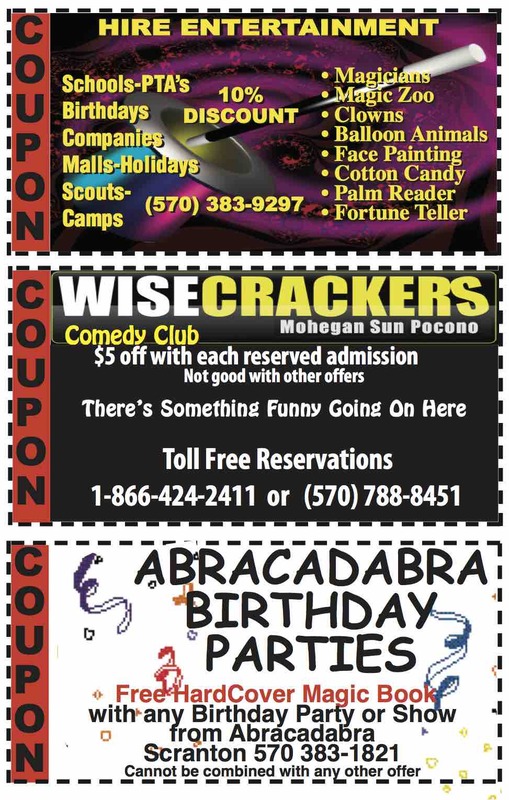 © by Pocono Coupons.com. Except for reviews, no part of any of this document may be reproduced in any form, without written permission by the authors. The graphics have been retouched, computer enhanced and resized by the authors. All rights reserved. Go to Quick list of over 200 SCRANTON POCONO area hotels and restaurants listed by area and town. Go to DETAILED List of areas Best Lodging listed by area and town.